We’d love your help. Let us know what’s wrong with this preview of A.R. Rahman by Nasreen Munni Kabir. When composer A.R. Rahman's first film Roja was released in 1992, his astonishing music with its other-worldly melodies, tonal texture, pulsating rhythms made an instant impact in India. His abundantly flowing talent has given life to the score of over a hundred films, including Dil Se, Bombay, Lagaan, Warriors of Heaven and Earth, 127 Hours and Jodhaa Akbar. According to When composer A.R. Rahman's first film Roja was released in 1992, his astonishing music with its other-worldly melodies, tonal texture, pulsating rhythms made an instant impact in India. His abundantly flowing talent has given life to the score of over a hundred films, including Dil Se, Bombay, Lagaan, Warriors of Heaven and Earth, 127 Hours and Jodhaa Akbar. According to a recent estimate by the BBC, 150 million Copies of his albums have sold worldwide. A.R. Rahman has won a host of awards, together with a Golden Globe, a Bafta, two Oscars and two Grammys for his score in Slumdog Millionaire. In 2010, he received the Padma Bhusan, the third civilian honour, awarded by the Government of India. To ask other readers questions about A.R. Rahman, please sign up. "When people ask me what’s the best way to compose a song, I tell them, a song has to come to you like the breeze. In South India we talk of the breeze that blows through the leaves of the coconut tree. It has a natural feel and makes the leaves rustle gently. It isn’t the same thing if you shake the tree violently." Journey of a maestro from a struggling childhood, composing ad jingles to a successful music director! This book feels like a transcript of a very regular interview of A R Rahman. Any book of famous musician should give detailed accounts of how he was feeling when composing a particular piece of music - what led him to chose one singer over another or one musical instrument over other. His collaborations, specially with Mani Ratnam, Subhash Ghai and Imtiaz Ali left me asking for more and gave nothing new which a fan already didn't know. This interview in video format would have been better IMO. Dull questions and wasted opportunity to interview a living genius. The author has brushed upon his craft and spiritual practice in a shallow manner. Hardly anything of insight was captured and as one amazon reviewer pointed out: this could have easily been a video interview than a whole book. The author seems to be enamoured by the presence of AR Rahman rather than be objective about the interview. The edition I read had an additional chapter to catch up on the present times. That chapter is eve Dull questions and wasted opportunity to interview a living genius. The author has brushed upon his craft and spiritual practice in a shallow manner. Hardly anything of insight was captured and as one amazon reviewer pointed out: this could have easily been a video interview than a whole book. The edition I read had an additional chapter to catch up on the present times. That chapter is even worse than the whole book. A whole two questions were dedicated to AR’s usage of Facebook and how many posts you puts up. I was sitting in a cafe when a friend told me that i haven't read non-fiction in a while. That sent a series of strange thoughts in me. Why do I always read fiction? Is there something beyond the marriage between beautiful words and master story-telling. And it was just a chance encounter that I picked up this book that evening. A.R. Rahman is someone who defines Indian film industry with his beautiful tunes. And as a big fan of Rahman Sir, it was such a delight to read his answers to some of the I was sitting in a cafe when a friend told me that i haven't read non-fiction in a while. That sent a series of strange thoughts in me. Why do I always read fiction? Is there something beyond the marriage between beautiful words and master story-telling. And it was just a chance encounter that I picked up this book that evening. A.R. Rahman is someone who defines Indian film industry with his beautiful tunes. And as a big fan of Rahman Sir, it was such a delight to read his answers to some of the best question that could have asked. To get more insight into his thought process and his views about various singers/lyricists/directors was such a delight to read. Loved how joyous his tone becomes when he talks of Mani Ratnam and his slight humour which is indicative throughout. Not that great! Takes about 1/2 hour to finish the whole book. Seriously...can do better. I am disappointed. It was just like a transcript of a regular 30-min interview where the discussion was on a selected few movies and compositions. To imagine the huge hoopla before its release, I am really disappointed! Amazing book about one of the best commercial and spiritual composer on earth. Very much recommended to anyone who is into creativity, professionally or non-professional because of his spiritual views that he can transform into his works. The book is not too long to read and much clearer if you know his works and other professionals in the industry. A pretty decent book which contains conversations with A.R Rahman basically about his life. This book basically gives the overall journey of Rahman in the music world, with the music world. It describes his experience with other famous music personalities. Overall a good book to read (It can be read in 2-3 hrs). A very good attempt on the maestro of Chennai. Very little was known about him (in terms of published material) and this book brings it out just in the right sense and the right way.. But, i hope many more writers do write about this wonderfully simple man. 3.5/5 short biography ~ 100 pages in form of conversations held over 4 yrs. Although it is short it is quite satisfying n well-rounded. Will be reading one more bio of Rahman and all by d author since I loved d style. 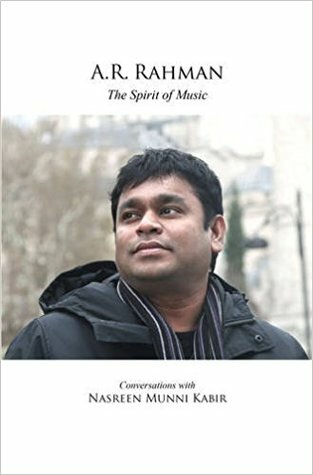 The book is in the form interview.. jumps from one story to another, some instances seems to repeat some stories..
A must read for all the Rahman fans and people who want to make music. Gives you a good insight on Rahman's thought process and music production process. Special instances like composition of Luka Chuppi.. you can find it nowhere! Though it's like a q/a session, interesting facts about arr is revealed, for a fan like me overwhelming !!!! !